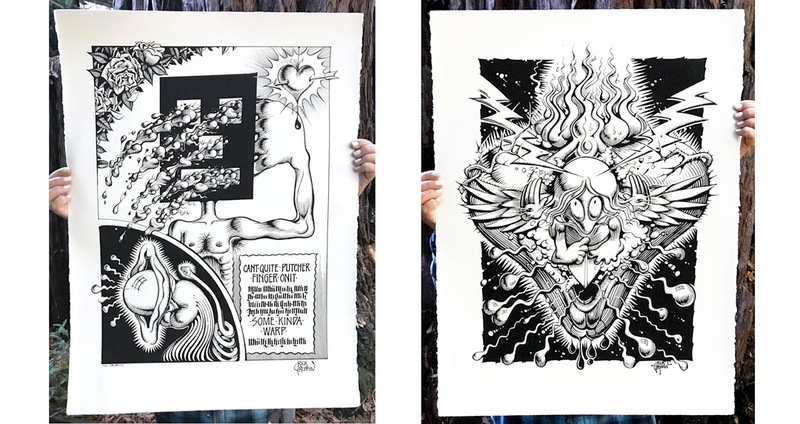 1xRUN is proud to present new hand-pulled screen prints and bronze editions from legendary 60s counterculture artist Rick Griffin! 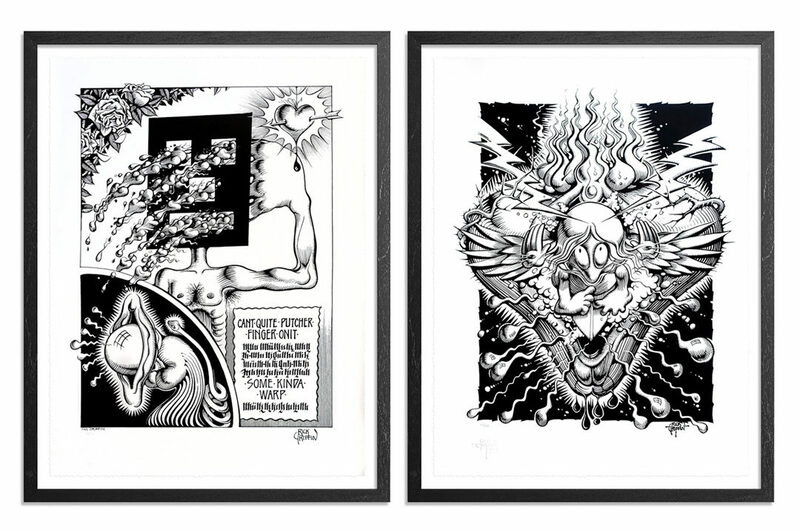 To commemorate what would have been the artist’s 77th birthday we are excited to showcase two bronze Soundproof Eyeball editions from Griffin, as well as two hand-pulled screen prints from what is referred to as his magnum opus Man From Utopia! Presented in partnership with the Chambers Project and the Griffin Estate we are excited to showcase each of these editions in extremely limited quantities. 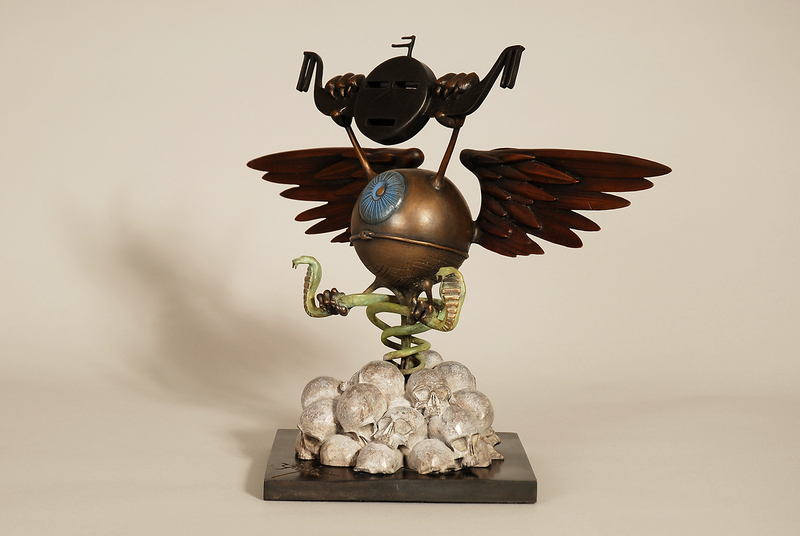 Read on for a closer look inside these unique editions from Rick Griffin. . . In 1966, Rick Griffin moved from Los Angeles to San Francisco and began shifting away from producing cartoons for Surfer magazine, which insisted on censoring his work, and towards designing rock music posters in San Francisco, which was a new genre of art that was all the rage in the counterculture. By 1967, Griffin was recognized along with Wes Wilson, Stanley “Mouse” Miller, Alton Kelley and Victor Moscoso as the “Big Five” artists who set the creative direction for psychedelic American rock posters. 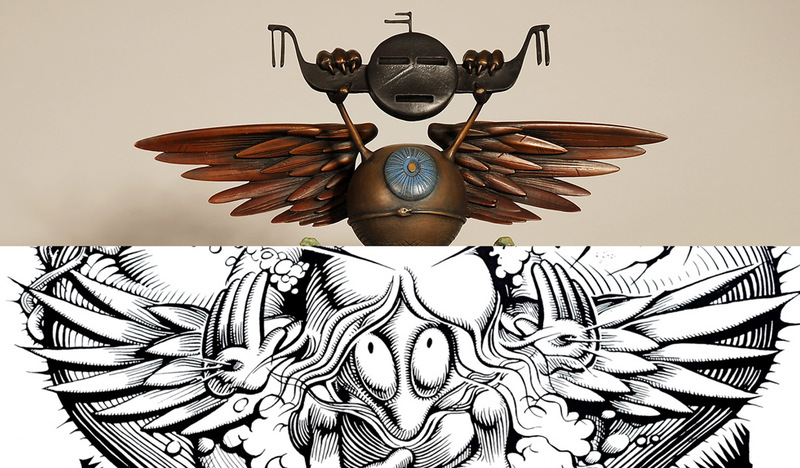 In 1968, Griffin’s rock poster art inspired Robert Crumb to invite him to contribute to Zap Comix, which Griffin readily accepted because he had seen Zap #1 and was excited about this new medium of art. As it turned out, Griffin proved to be the least prolific artist in the Zap Comix series, but his contributions established him as one of the most influential forefathers of underground comics and would propel Griffin to extraordinary achievements in the field of graphics and illustration. Despite Griffin’s embrace of the counterculter in mid-’60s San Francisco, his life path did not take him down the same road as most of the underground comic creators who were his peers. In the spring of 1969, Griffin and his family (consisting of his wife Ida and two daughters at the time) split San Francisco and ended up returning to his native land in Southern California. 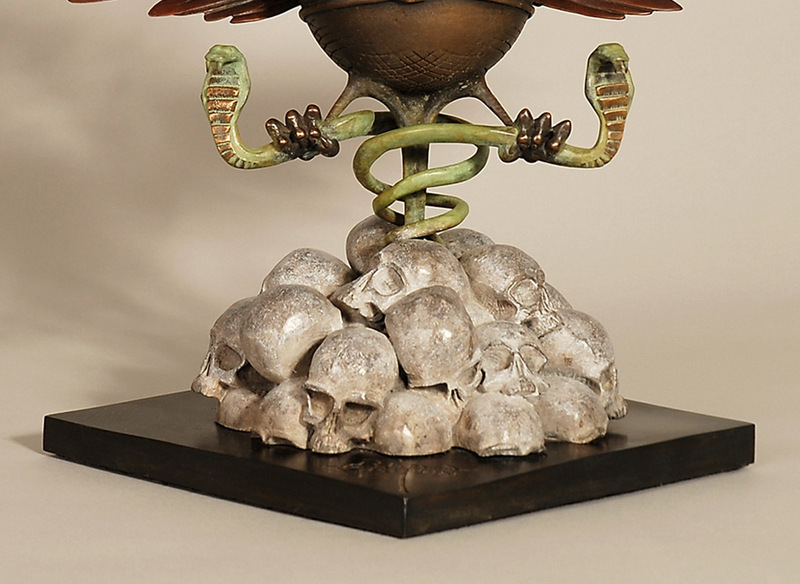 By 1970, Griffin had adopted Christianity (in his own way) and the presence of Christian symbols proliferated in his artwork, a trend that would gain strength in the years that followed. One of the first major publications Griffin produced after his conversion to Christianity was Man from Utopia, an oversize, deluxe magazine which essentially presented a portfolio of his illustrations from 1970 to 1972. Man from Utopia reproduced work that Griffin had created for concert posters, album covers and his memorable poster for John Severson’s surfing film, Pacific Vibrations (Severson was the founder of Surfer magazine). 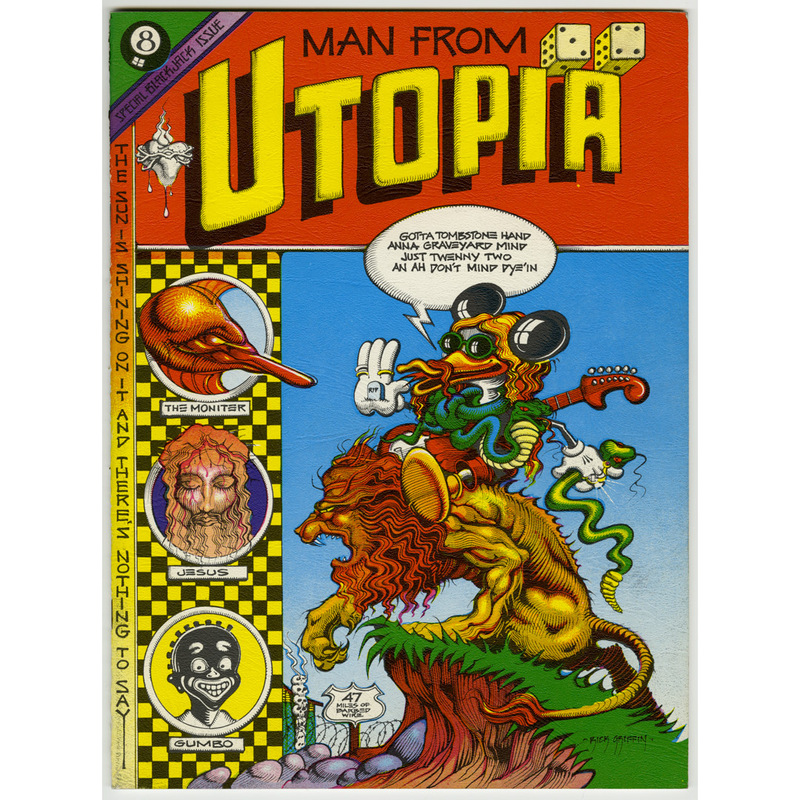 Despite the spot illustration of Jesus on the front cover art, Man from Utopia was one of the last publications Griffin produced that was not dominated by Christian imagery, though it is repeatedly punctuated by Christian symbols. Man from Utopia is first and foremost a remarkable collection Griffin’s most beautifully composed illustrations, which include recurring icons far removed from Christianity. Hearts, roses, pussies, light bulbs, aliens and skulls flourish throughout the book, embedded in Griffin’s complex, sharp-edged ink lines. Despite the lack of a specific story or defined narrative in Man from Utopia, the drawings feel like they are thematically connected, delivering precious lessons for those who are patient enough to absorb the entire scope of their message. In 1968 Rick Griffin produced his epic poster masterpiece of symbolic iconography, ‘The Flying Eyeball’, in a burst of inspiration. The image has arguably become the most recognizable and evocative image of the psychedelic 60s, being to Psychedelic Art what Warhol’s soup tin is to Pop Art – an instant identifier for the age of Acid Rock. The Winged Eye symbol has its origins in antiquity, appearing in the art of the Egyptians and Assyrians. 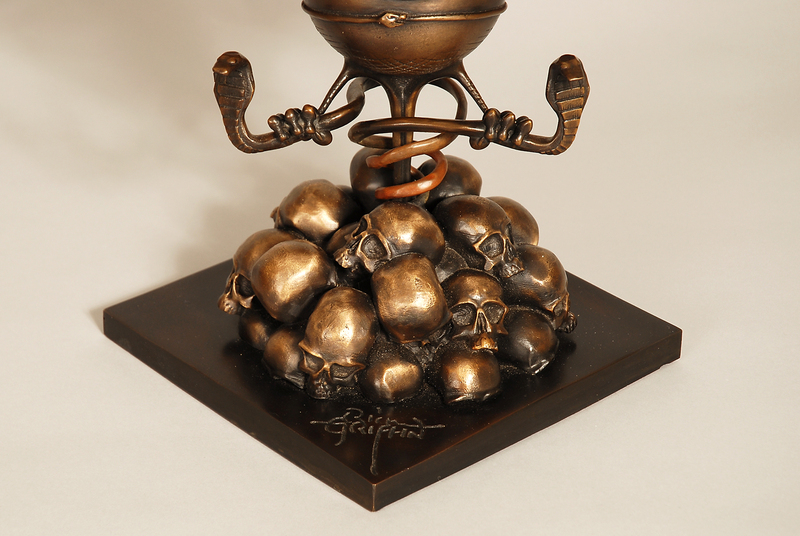 Rick particularly venerated the late 1950s’ version, that of famed lowbrow artist Von Dutch, whose interpretation resonated with the roots of hot-rod culture, so central to Rick’s Southern California upbringing. 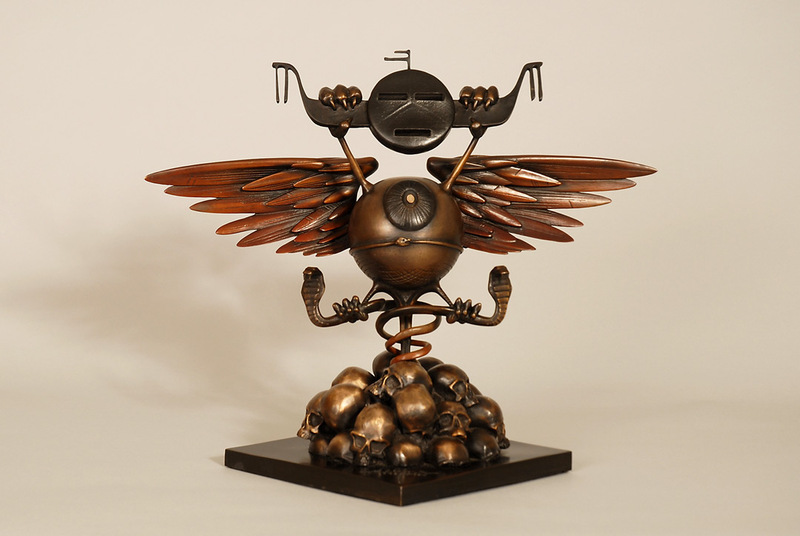 Von’s Flying Eye was stylistically informed by traditional American tattooing and car culture and he may also have been exposed to this image as nose art on WWII USAAF airplanes, an art form that influenced decorative automobile art in the post-war period. 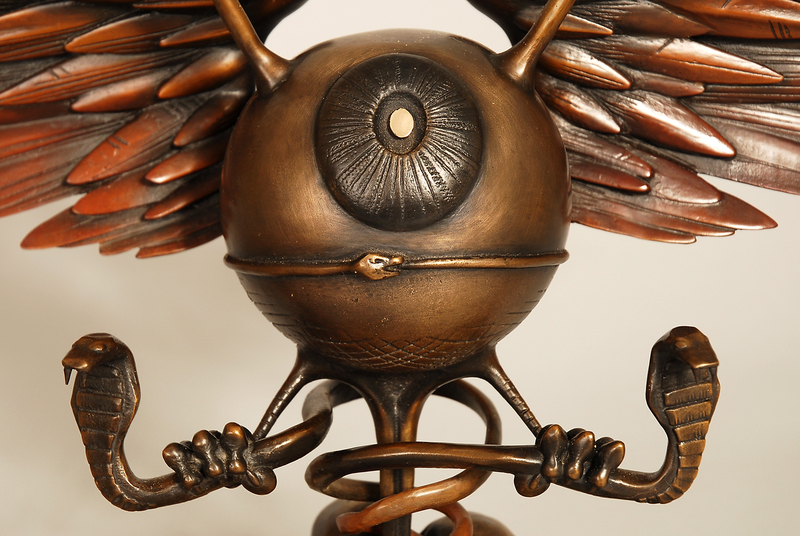 Rick would also have been aware of the esoteric traditions and origins of the Eye In The Sky, aka The Sun Disc or God’s Eye, the all-seeing eye that burns through the clouds of Illusion. As a visual pun it also represents the self (the ‘I’), as well as the personal power that comes with spiritual awareness. 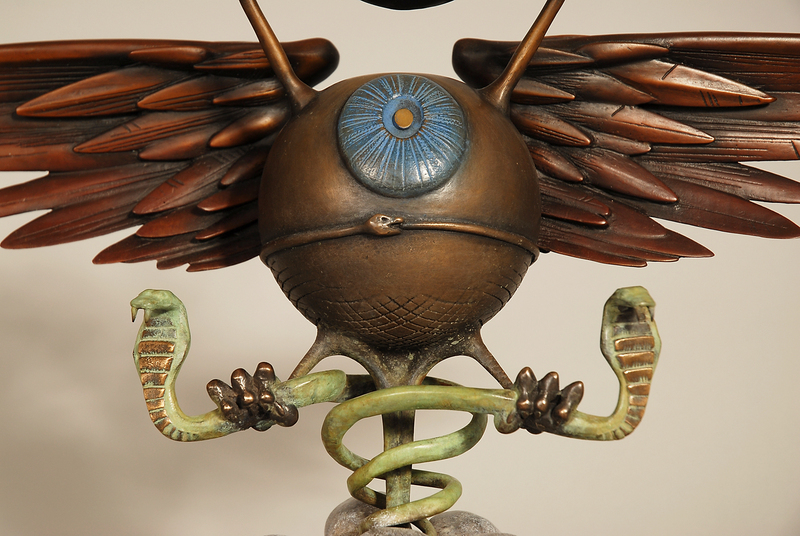 With added wings, it evokes the effect that LSD had on the visual field, part of the expanded state of consciousness that many were experiencing at that time. In 1968, when psychedelic posters were an integral part of the Haight-Ashbury scene, The Flying Eyeball and other designs like it were becoming a pervasive influence. Apart from being posted around San Francisco’s Bay Area in record stores, bookshops and hip boutiques they circulated nationally, and even internationally, becoming in a sense ambassadors of the counter-culture movement. Admired for their startling effect and challenging lettering, these posters were eagerly collected. Everybody – the fans, the musicians and the other poster artists – could see that Rick had surpassed himself with this poster and that a barrier of sorts had been broken. The original poster was reprinted before the year was out to satisfy commercial demand. It became synonymous with the psychedelic scene, being reproduced on clothing, products, books and magazines, not to mention in print editions and numerous reprints. These posters, and the music they announced, were a huge cultural influence and a large part of the attraction for young people to drop out and migrate to the Haight. Art directors and design professionals succumbed to the psychedelic allure as well and the result stylistically defines the mid-60s to mid-70s in Western culture, with the years 1968-70 generally regarded as a zenith for psychedelia. Graphics, art, design, music, movies, clothing, all were colored by it until the scene imploded. However, the shock-waves of the movement were felt over the subsequent years. *Information from Rick Griffin on Wikipedia, M.Steven Fox’s Man From Utopia on ComixJoint.com and Rick Griffin on Bonhams auctions.